400 Years of Blood, Sweat and Tears Christina, Grant, Mimi, and Papa travel to Jamestown, Virginia and learn that "founding" a new nation is no easy task During Jamestown's Quadricentennial Celebration, there's plenty of history, mystery, legend, lore, lost bones, and more Joe the archaeologist is accused of stealing priceless "skeletal remains." 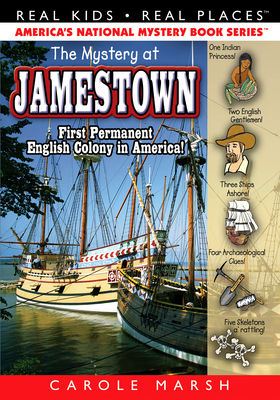 Curious clues lead the kids on a whirlwind chase from Jamestown to Williamsburg to Yorktown. Christina and Grant meet Pocahontas and Captain John Smith They get lost in the creepy woods And, they acquire an adorable new pet who will be part of all the future books in the super Carole Marsh Mysteries But in the meantime, Christina asks, "Who's bone IS this? " Renaissance Learning, Inc now has Accelerated Reader quizzes for all of the Carole Marsh Mysteries To visit their website, click here.